The Phillips Chocolates story begins in 1905 with Philip Strazzula and Concetta DiMare, Italian immigrants from Sicily, seeking opportunity and a new way of life in America. They met, fell in love and were married. Leaving behind his earlier career as a fisherman, Philip’s first job in America was in a candy factory. Quick learners, both Philip and his wife were soon making chocolates in their Revere, Massachusetts kitchen. The Strazzulas opened their own candy store in Belmont, Massachusetts in 1925, selling the family chocolates along with homemade ice cream. They called the shop—open until 1977—Phillips Sweets, because they felt the spelling with two L’s was more “Yankee-sounding.” Concetta handled sales and hand-dipping the chocolates, which Philip always made personally. He was a stickler for high standards, and liked to say, “You have to put in the butter and the cream,” meaning there could be no variations from the family recipe. He always made sure only the highest quality ingredients went into every batch. Fast forward to 1952 in Boston, where their two sons, Philip Jr. and Matthew (joined by brother-in-law Joseph Sammartino) opened Phillips Candy House on Morrissey Boulevard. Their family business grew over the years, first with the help of their wives, then with the addition of Philip’s son (Philip III), and Joseph’s son (Joseph Jr.) and daughter (Mary Ann Nagle). Mary Ann became the company’s General Manager, retiring in 2018 after 35 years. Up until passing away in October of 2016, Anna Sammartino (Joseph and Mary Ann’s mother) was still the “chief taster and critic” at Phillips. All new products first had to pass her inspection, and she had a reputation as a tough critic. Her favorite was refrigerated Bittersweet Peppermint Patties, and she had one a day believing they would lead to longevity, which might just be true—she lived to be 103! Today, Michael Pocrass manages the shop with the help of his team: Chief Chocolatier Brian Pandolfi, Store Manager Carol Carll, and Terri Ferolito, Manager of Fulfillment Operations. Together with the same candy makers and staff that have worked with the family for more than a quarter of a century, all share a love of chocolate, leading to constant new creations. A recent example is their blended chocolate, a mix of premium dark and milk chocolates that is less bitter and less sweet than all-dark or all-milk chocolate, and appeals to both dark and milk chocolate lovers alike. Throughout all the years in business, founder Philip Strazzula’s fundamental rule is always upheld and honored: Only the highest quality raw materials are used to make Phillips Chocolates. 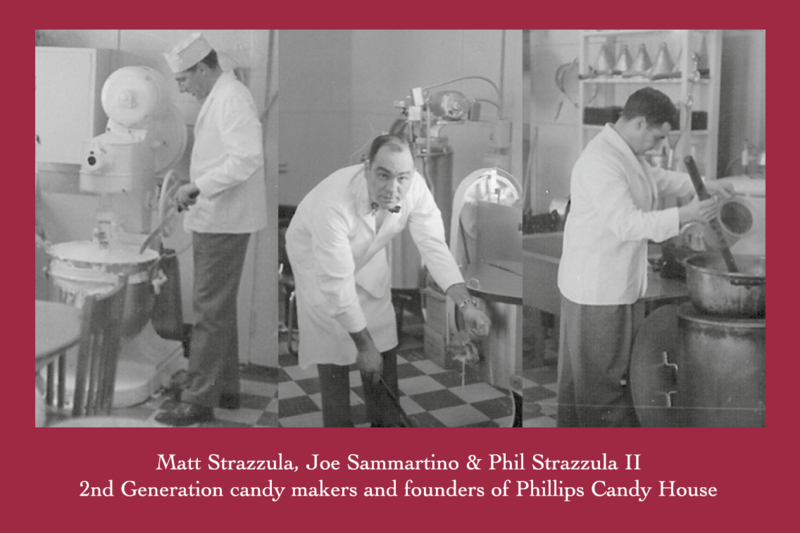 This commitment to excellence in the Phillips Family tradition is reflected by a photo of Matt, Phil and Joe making candy, included in every box.